Friendship is a precious gift and friends are the veins of this great relationship. A best friend stay beside and hold on forever to share every moment of life with care, support, advice and always try to spread happiness. Surely, you have also blessed with such kind of best friend who leave no stone unturned to make you happy and do so much crazy stuff with you just to see you smiling. 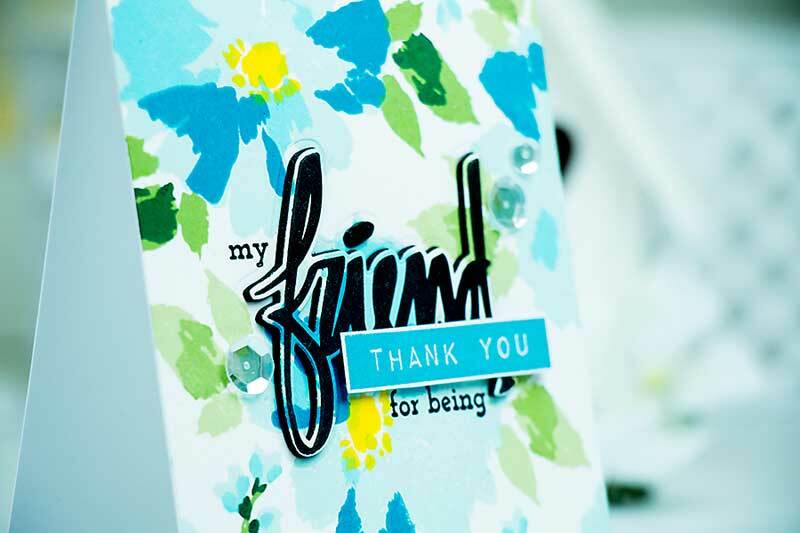 So, what do you want to appreciate your best friend, sending Thank You Messages For Friends or a sweet notes with some funny words? Let’s take ideas to write a sweet thank you message for your best friends and appreciate them for all the smile, care, fun and support you have got from this true friendship. 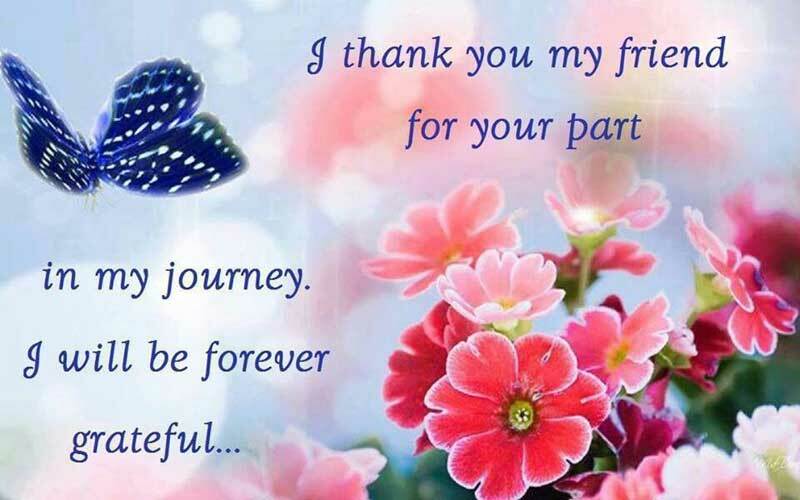 Below you will find lots of thank you messages for friends which you looking for and choose the right one to share with your friends. I know it is not my first time to say this, but I just can’t stop thanking you for your wonderful presence and thoughtful efforts. Thank you. There is no one with whom I can share my tears and fears, if you were not here. Thanks for being by my side, and always giving me reasons to cheer. Being friends with you makes me want to celebrate every day as Friendship Day. Thanks for adding truckloads of joy and happiness in my life, everyday. You believed in me when even when I stopped believing in myself. 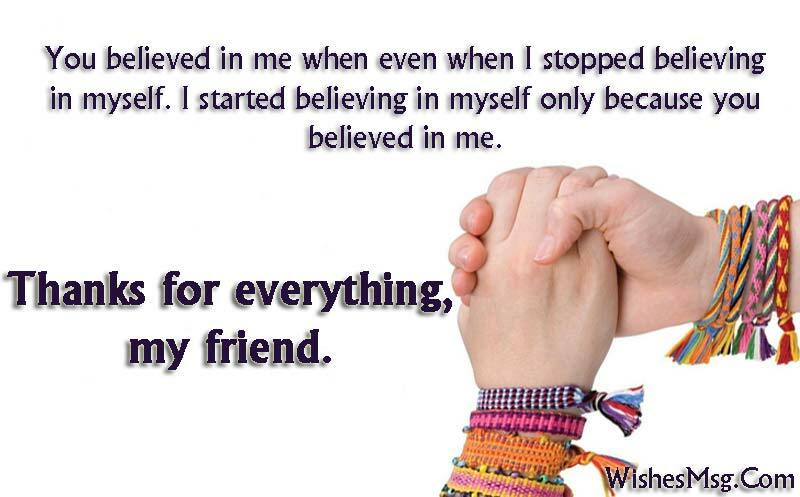 I started believing in myself only because you believed in me. Thanks for everything, my friend. When the time wasn’t right and the sun wasn’t bright you happily stuck by my side and helped me to do things right. Thanks a lot, my friend! Thank you so much my dear for walking along in the way of life with me, you have no doubt made my journey easy, life would have been so boring and exhausting if would have missed you companionship. Throughout my life, everyone could see the tears in my eyes… but only you could feel the pain in my heart. Thanks for being my friend. Every time I need a support in life, you are always there standing behind me. So good to have you in my life, you are truly a great friend any one can ever have in life. You mean a lot to me, you are truly caring. Thanks a lot, because of you my life is a bit more wonderful. I don’t think I would have been able to make it so far were it not for you kindness and generosity. Thank you from the bottom of my heart. My dear friend… thanks for walking with me when I needed support, thanks for walking ahead me when I needed guidance and thanks for walking behind me when I needed someone to watch my back. I have heard that friends do a lot in life. But, now I saw for myself. I can’t thank you enough for the pain you took for me. I appreciate the time and efforts. So, glad that I have a loving friend like you. Truly thank you! Crazy, wacky, silly but always there for me, love you, my friend and thank you for being there with me always. I feel life would have been nothing but whack and wallop if there were no protection like you in the fabric of my life. It is due to your presence in my life that has made me so much enduring. I thank you for be the part of my life. You have been generous and gracious always. Thank you for being so supportive friend. If I could give our friendship a name, it would be Memories Unlimited. Thanks for giving me beautiful memories that I am going to cherish for a lifetime. Thank you for being there for me when I call you and need someone to just listen. It doesn’t matter where we are in this world or in our lives, I know you will always pick up. I don’t know what loneliness means, because sad and alone, I’ve never been. Through all of life’s murkiest corners and bends, I’ve always sailed through, because of you, my friend. Thanks. You were always there for me when no one was. Accept my sincere thank you, because you mean a lot to me. Thanks for being there! Just like how a rainbow has no value without its bright colors and a perfume has no value without its fragrance, my life has no value without a friend like you. Thanks for being my friend. It’s truly rare to find a good friend like you. And, you have not made me feel the blue. So, I wanted to tell you a special thank you from my side. You did so much for me that I won’t be able to pay you back in return. Thanks my friend, you are the best. Sometimes I feel that you are my guardian angel. If you are, you are doing one hell of a job. Thanks, mate! The secret to lifelong friendship is to treat is not just as a gift, but also as a responsibility. Thanks for playing your part to perfection. Thank you for being there through all of the significant others I have mistakenly chosen over you in obvious moments of weakness. It is always because of your presence life seems so easy, your few day absence has make me feel that how important you are for the peace in my life, I feel all the pleasure and peace is linked to you and your presence in my life. Visualizing the outcome of this mess without your intervention sends shivers down my spine. Thank you for being around. We have done everything together since childhood. 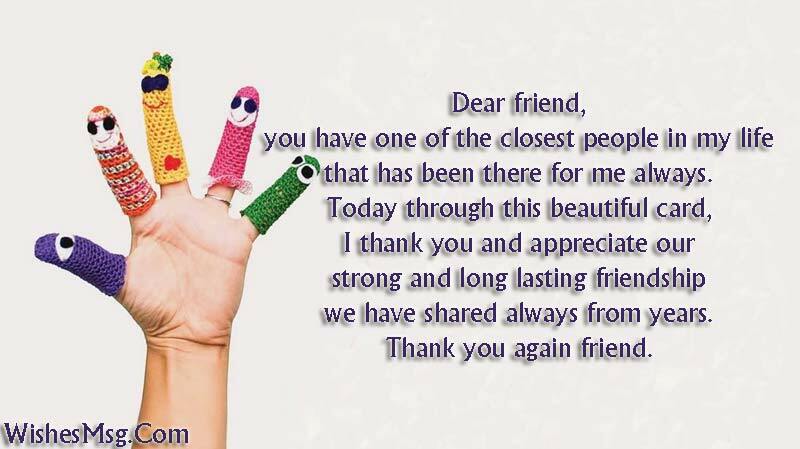 Today I just want to thank you for being such a wonderful friend. I look forward to sharing many more of life’s lovely moments with you. O my dear friend you are a cool breeze for me in the hours of warmth when it is tough every where your companionship gives me a sigh of relief. Thank you so much for be the part of my life. Thank you dear friend for being by my side and helping me in times of need. I will always remain indebted to you. I am aware it is a big challenge for you to be on my side, but you never mention it. I’m so thankful! Thank you for being my friend, you have filled my life with pleasure and amusement and had spread so many color around it, I wish to walk along you till the last moment of my life. Dear friend, you have one of the closest people in my life that has been there for me always. Today through this beautiful card, I thank you and appreciate our strong and long lasting friendship we have shared always from years. Thank you again friend. You’ve stuck by me through so many ups and downs and I want you to know that I’ll always be there for you. Tons of Thanks. Thank you my dear friend for being so amiable and accommodating with me, without you my life would have been so tough and hard, there would have been no colors or cheers in it if you had not been joined me. A good friend is really hard to find and I am glad that I have found mine. What you did for me is not something I expected. But, you went out of your zone to make me feel comfortable, and that truly says a lot in life. Thank you so much for everything! Thanks for being such a wonderful friend. You have always been there be it times of joy or despair. To my best friend who has been there every day by my side, I appreciate your effort and our friendship always and thank you for the love and support you have showered on me always. Have a great day friend. My happiness is centered around your love! Thank you for being the light of my life. Thank you for celebrating all of the exciting moments of my life with me. I can’t imagine not having you in my wedding or by my side when I hold a little human in my arms that I magically created. You don’t need friendship day and don’t need to wait for your friends birthday to show your thankfulness or love which you carry in your heart for them cause everyday in friendship is a great day to care and share. We believe that these thank you messages for friends will make your way easy to thank your friends not today but always.